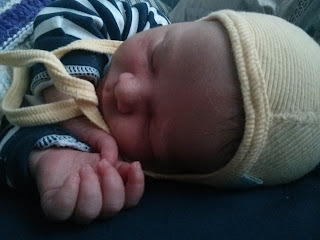 My Little One is now seven months old and only now do I have the time to write his wonderful birth story. Thus is the life of a second-born child, I fear! His birth perfectly reflects the person that he is: Patient, amicable, without too much fuss, surprisingly easy. He waited inside my belly, despite three weeks of regular contractions, until the perfect time; He waited until my mum had arrived from Australia, then he waited for his big brother to feel comfortable with his Nanny caring for him, and then he waited for me to put my big boy to bed one last time as an only child. He then, as the icing on the cake of perfect timing, made sure that he was outside of my tummy by the time his big brother woke up in the morning. Even now, if his older brother is crying for some reason, he will wait. It is rare that I am bombarded with two crying children simultaneously. Sure, the moment his brother stops crying, he sees his window, but that is him: Patient, amicable, beautiful. 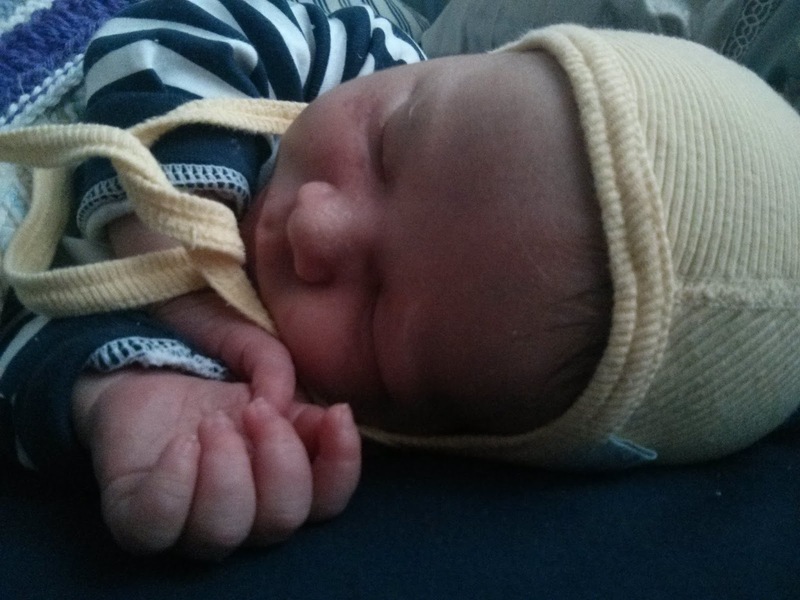 My mum was planning to arrive four days before the due date, and it turned out that this bubba was waiting for her. He was also waiting for something else: The beads. Mum had developed a secret plan of collecting beads from all of my friends and family throughout my pregnancy, in the hopes that I would have a long string of very different, very personal beads to hang above me and know that I had all of those people, both close to me in Switzerland and half a world away in Australia, plus a few from USA and Canada, holding my hand and telling me that everything was going to be okay. Most of the beads were sent to me throughout my pregnancy, which was really just so beautiful, but my mum would be arriving with a whole bunch more. So this baby knew to stay inside until then! his brother’s birth: There’s a House Inside My Mummy. 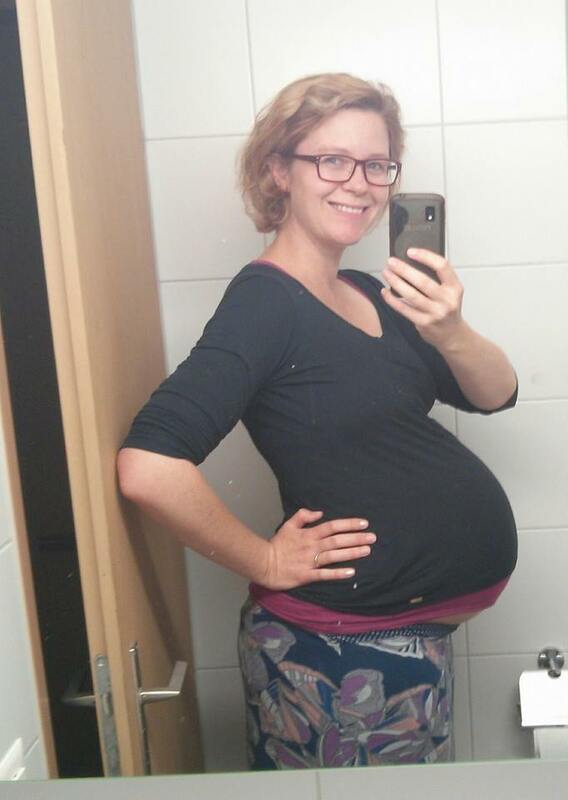 On the 13th of October, contractions started in the afternoon as usual. I made dinner, I tidied, and I became aware of the fact that they were really getting stronger this time. I listened to music with my big boy, stroked his beautiful hair as he watched Charlie and Lola, and then I put him to bed. I cried and cried and cried during that bedtime as I sang him ‘The Long Time Sun’ song, knowing that this might be the last time I put him to bed in that way, the last time it would be just us. I knew that his entire world was about to shift and he had really no idea. I knew that I would never be able to be there for him again like I had for every moment up until that one. And so I climbed into bed with him that night, clinging to the rail through my contractions, holding him against my body. When I had visualised my dream labour situation, I had always hoped that I would get to put him to bed one last time, and then by the time he woke, he would have a baby brother. And that’s exactly what happened! I called my midwife, I told her things were different, and she told me to have a bath. This time, instead of the warm water easing the contractions a little, they intensified. I called her again, described how the pain was now much moreso in my legs and hips, she listened to me talking to her and told me that yes, this was it, I was in labour. This time, she told me to go to bed, try to sleep, and call her when I was ready to go to the hospital. Just after midnight, I was no longer able to stay in bed, no longer remotely comfortable. I woke my man, told him it was time to go, and then went to the spare room to wake my mum. Once she recovered from jumping out of bed so quickly, she moved into our bed for the rest of the night, as our boy would religiously wake and sleepily walk into our bed, climb in and go back to sleep. We were all a bit nervous of how this would work, but my mum said that he didn’t even register that it was her in the bed – he just climbed in and went back to sleep. Phew! Anja, my midwife, was of course there when we arrived. Both birthing rooms were already occupied, so she had set up a different room so it looked as relaxing and lovely as can be. We put on my birthing music – the music from my prenatal yoga from years ago, the same music I had used for my first birth – and hung my beads up on the bed, Anja got us some tea, and we just hung out for a while. My contractions were strong, but I was completely lucid and pain-free between them, a totally different scenario to my first birth, where the pain was continuous from the outset. She sat on the floor cross-legged, chatting to me between contractions about her studies, I talked to her about mine, she told me that I should really consider studying midwifery at some point, I told her that now was probably not the best time to try to convince me of that… It was all just very lovely, actually. Through each contraction, I’d turn over onto my hands and knees on the bed, Duncan would massage my back and talk me through it, and then it was done. At some point I told her that the pain was beginning to seriously move into my back, which was one of my greatest labour fears, as my first was posterior and that was unbelievably rough. She reiterated that this bubba was not posterior, and asked how I felt about being given an enema. She said that there is a chance that it would relieve some of the back pain, and I agreed to giving it a try. It was awful. I won’t go into the gory details of the process, but having severe explosive diarrhoea every minute, while also having incredibly intense contractions at the same time? Not advisable. One requires you to sit, the other makes sitting impossible. Anja admitted to me afterwards that while, yes, there is a chance that the enema would relieve back pain, the other reason she suggested it was to speed up my labour. She said that the way we were, chatting away through each contraction, could easily go on for days. As it was, I had my baby in my arms only two and a half hours later! After that, I was no longer able to sit or lie down at all. The contractions became almost continuous, with a very short break between only to catch my breath and attempt to gain enough strength to move my body to a potentially more helpful position. Once again, I was suffering from intense nausea and had to hold onto a bowl and often was gagging through each contraction… not so nice. I began to enter that bubble, where the world becomes fuzzy, I become unable to open my eyes, unaware of the world around me and completely retreat into myself. One thing I do remember at that time, though, was Anja, Duncan and Tanja (a young women’s doctor there who is also my acupuncturist and with whom I hold a pretty close relationship. We promised to call during my labour, and she came straight over to witness it – though I don’t remember when she arrived) all groaning in unison to try to get me back into my deep moans rather than my panicked screeches as things got nearer to the end. I remember hearing one of them laughing at the noise they were all making, and thinking that it was indeed hilarious, but being completely unable to come out of my bubble to express that in any way. I hit the wall. It became too much. The nausea, the incredible steamroller that was driving through my body continuously, the inability to catch my breath, the feeling of being about to black out from the pain of it. Again, I remembered my last labour: I remembered being filled with those feelings, but then I was immediately relieved, as I had heard that these feelings often signified transition – that point where you were fully dilated and about to push – but it turned out, the first time, that I was only 4cm. Not even half way, and twenty hours into labour. This time was different. I opened my eyes for what felt like the first time in an age, locked eyes with Anja, who was holding onto my foot at the time, and though I was unable to speak, she understood. “You’re in transition, Joh,” she said. I had done it! I was in transition! I don’t think I have ever heard more beautiful words in my life. It was almost over! And then came the urge to push. I was scared to push, fearful that maybe, like last time, I wasn’t yet fully dilated and pushing could cause some serious damage. “Go for it!” she said, and so I went for it. I pushed once, and she laughed, told me to ease off a bit, that I was too powerful, which made me feel like a total warrior. Two more pushes, a few gasps as I felt that fire of crowning, and his head was out. One more, and out slipped his beautiful body. So simple, so perfect. 5.04am, and my littlest love was born. Just out! All that hair! My eyes were open. I looked at Duncan, so incredibly rellieved that I could finally reveal my big secret. “It’s a boy!” he said through laughter and tears, and I laughed and laughed. He had been so convinced that it was a girl, and it was such a release to finally share this knowledge with him after keeping it a secret from everyone on earth for such a long time. The first thing that hit me was how different he was to our first. A head of beautiful, very dark hair (which has now vanished and he is also a blondey! ), and he was immediately crying. Our first boy took a solid fifteen minutes and a bit of assistance before he began to cry after such a long and tough labour, but this little baby was the absolute picture of a quick and by-the-book labour – in fact, his face remained quite bruised with a red tinge for the first five days or so because the pushing happened so quickly. He immediately looked like the name we’d chosen. It’s incredible how perfect that name suited this chubby-cheeked, double-chinned, dark-haired little baby instantly. Mama, Papa and The Little One with the beads. And then came the moment where I would breastfeed him; The moment I had been so nervous about, unsure of the anxiety it would bring, unsure even if I would want to, if it would make me feel some kind of repulsion or loathing… but no. This new, slimy little baby latched himself perfectly to my breast and it felt like the most perfect, natural thing in the world. I was met with a flood of relief. Sure, I knew it wouldn’t feel like this forever, and I knew that we would have things to work through, but right now, for that first feed, things were perfect. And the plan of having no plan, of taking each feed as it comes, hour by hour, day by day, was underway. It’s working! Well… it was. 🙂 Day 2. Zero jealousy from the big brother, just adoration. At home, our big boy woke up in our bed, and Nanny was there next to him. She told him that mummy and daddy were at the hospital and that he had a new little baby brother. He was apparently very happy and excited about it all, and still, seven months later, talks about how his brother brought him a fire truck when he came out of mummy’s tummy, and how he loves playing with the wooden train at the hospital. The first time they met. And thus began our lives as four. 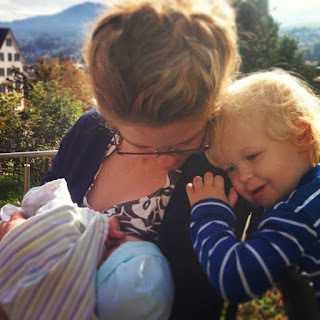 What a beautiful birth story, thank you for sharing. Aww thanks Neeta. That comment made me read through it all again. Funny how just a few hours can be so life-changing.